The 60-mile Stour Valley Path stays close to, and is often beside, one of England’s best-loved rivers, the Stour of Suffolk and Essex. 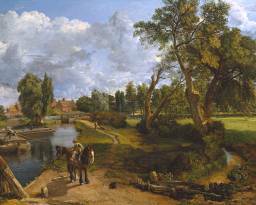 To Britons the Stour has been made famous by the great landscape painter John Constable through images such as Flatford Mill and the Haywain. Much of the countryside is still recognisable from his time, and is classified as an Area of Outstanding Natural Beauty. 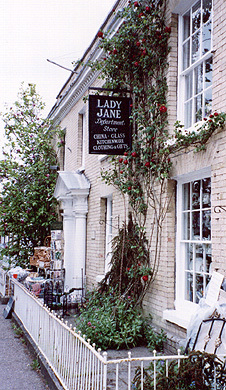 On this walk in 2002 and 2003 Dave Travers and I walked downstream, starting at England’s horse-racing capital Newmarket, through pretty villages and small towns such as Clare, Long Melford and Nayland, to the path’s terminus at an (alas uninspiring) picnic park at Cattawade. From here the Stour is broad and tidal; if you wish, and Dave and I did at another time, you can trace its final miles to the North Sea along the Suffolk Coast and Heaths Path. From Long Melford downstream, much of this path is coincident with the St Edmund Way, which Dave and I later walked upstream. The most recent guide to the Stour Valley Path was published in 2014 by the Dedham Vale AONB and Stour Valley Project and is available both as a printed leaflet and a set of pdf downloads. It’s not difficult however to follow the route using Ordnance Survey Explorer maps 210 and 196, on which it is marked. 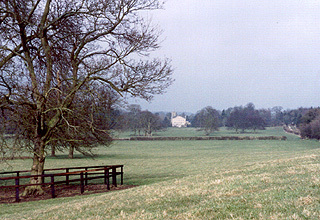 Newmarket owes its success as a horse-racing venue to its heaths. Wide, open, slowly rolling, and well-drained, they provide many training gallops for the dozens of thoroughbred stables as well as the town’s two racecourses, home to two of the five English ‘classic’ races, the 1000 and 2000 guineas. The National Stud, National Horse Racing Museum and Tattersall’s sales are based here too. The only problem, from a walker’s point of view, is that the Stour is some way away; perhaps the path should have passed through the small town of Haverhill, for the river does, close to its source. Another of England’s great artists, Thomas Gainsborough, was born in the Stour valley, at Sudbury, the half-way town on this walk. He is commemorated both by a museum in his birth house and a statue in the market square. Sudbury is a major transport hub for the Stour, with buses serving most villages reasonably frequently as well as the rail line. I was able to do much of this walk by public transport from my east London home, using the rail lines to Sudbury, Colchester and Manningtree and the bus links from the first two towns to places such as Clare and Nayland. Newmarket has a rail service too, but bus services north of Kedington are rare. Much of the area is well provided with accommodation, in the north as a result of the need to cater for racegoers (obvious warning – avoid Newmarket on race days), and from Stoke by Clare eastward to the general popularity of the region with tourists. 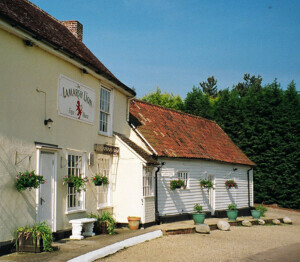 The Suffolk County Council guide referred to above lists some B&Bs that might not otherwise be easy to source. Two lovely little pubs with rooms, right on the path, are the Lion at Lamarsh and the (rather more up-market) Angel at Stoke-by-Nayland: I stayed in both during 2004 (though not on this walk) and can recommend them, though I’m not sure the former still lets out rooms. Soon after leaving Newmarket town centre, the Path takes one of the heathland gallops (alongside the A1304) until it meets an ancient rampart, Devil’s Ditch. After the first village of Stetchworth there are several empty miles, overgrown this late autumn day – how a couple of cyclists we later met heading north would have coped with the gorse I don’t know. At length the headwaters of the Stour are met after Great Widgham Wood, and the young river proper soon after. Great Thurlow is smaller than Little Thurlow; still very much a squire’s seat, it seems. Just so you know: on this stage I was carrying a frozen shoulder and, courtesy of insufficient lacing on the London Loop the day before, heel blisters. From near the start, there are good views back to Great Thurlow Hall in Fourteen Acre Park. 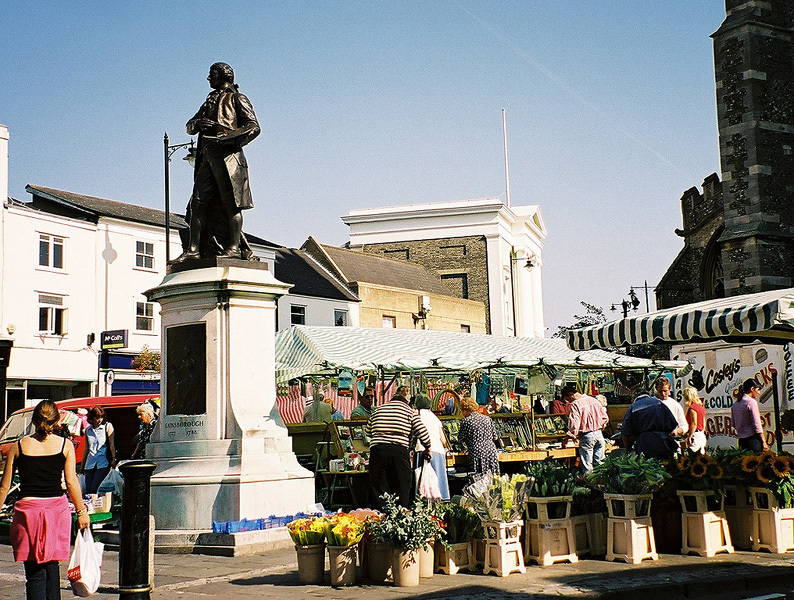 Kedington is a fairly ordinary village, and the field thereafter is something of a prairie – big enough to swallow the square mile of the City of London! But one of the classic stretches begins not far away at Baythorne End, beside the growing river into the village of Stoke-by-Clare. 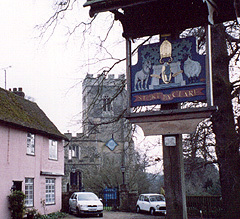 Clare itself is the major settlement of the upper Stour. 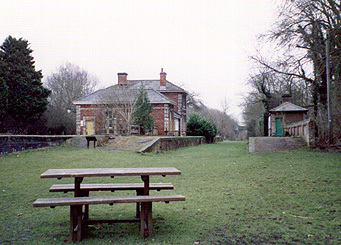 As well as its Priory and Country Park, it is the terminus of the Bury to Clare Walk. The walk takes a long detour northwards, though with good views across the valley, dipping back to the river at Cavendish and heading through Glemsford and across the quiet tributary of the River Glem. 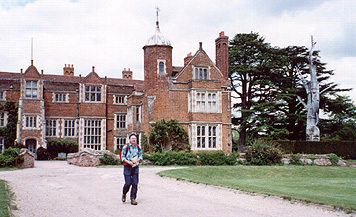 Kentwell Hall and the adjoining parkland are a grand way into Long Melford, its church showing the wool-given mediaeval wealth of the district, and its main street showing shops from a time warp. I took the final approach to Sudbury, through water meadows, pretty fast: the rail line that once served the upper Stour now ends at Sudbury, and I was keen to make the hourly train, which I did just. A hot day after a hot summer. The fields were parched, more savannah than Suffolk. The path misses one trick just before the Essex hamlet of Lamarsh (good pub), where unaccountably it takes a scruffy line over plateau to Lamarsh Hall instead of heading over to and along a lovely little side valley to the south. Walk 24 in my book Walking in Essex puts this right. Bures is a working village, in two halves, one in each county; the river forms the boundary. Wormingford has a pleasant churchyard. On the way into Nayland look out for as steep an aircraft landing strip as you will see. A change in the weather: steady rain to Stoke-by-Nayland, and overcast thereafter. Nayland itself is a very substantial little place, well seen on the Path first from the river and then through its coaching inn centre. The church at Stoke rose quietly out of the mist. After the village there is another pretty little tributary, the Box, and on the way back to the river there is a smashing green lane, Snow Hill Lane. At Stratford St Mary we lunched at the half-timbered Swan, a wonderfully eccentric place with welcome fire. From here the river meadow walk to Dedham Bridge and Flatford Mill is very much Constable heritage country; he was born just up the road in East Bergholt. A shame then that the Path peters out along the B1070 to the nondescript picnic site at Cattawade. It’s even worse if, as had we, you have to trudge along the busy A137 for the mile or so to Manningtree station.